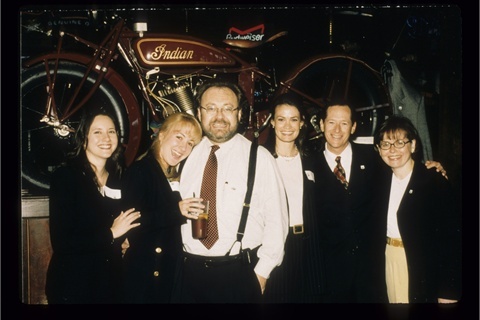 George Schaeffer has built the American Dream. Schaeffer immigrated to the United States from Hungary with his family in 1956. After receiving his college degree from City College of New York, Schaeffer began his career in the family garment manufacturing business in NYC. With an enormous appreciation for America and a dream of an even better lifestyle, Schaeffer heeded the famous words, “Go west, young man,” and moved his family to California in 1981. In Los Angeles, Schaeffer started on the path to what would make him a legend in the beauty industry. 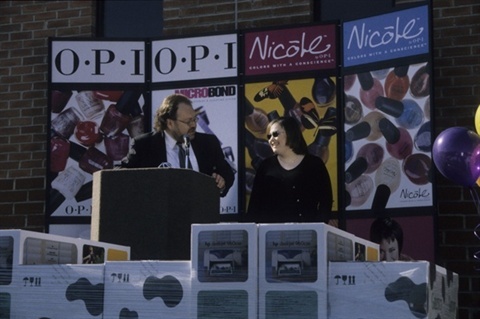 The path started in the most unlikely of places – a dental supply business that Schaeffer purchased called Odontorium Products Inc.
[right] George Schaeffer, president of OPI Products, and his daughter Nicole, host the OPI Annual Computer Giveaway to OPI employees at the company's North Hollywood, CA, headquarters.